Bellevue Gallery was proud to open in September 2006 with a humanitarian exhibition entitled “Scarcity and Abundance.” Following a group of concerned individuals including, Paddy Ducklow, Sharon Ferriss, Tim Hardy, Rory and Lisa Holland, Janet Laver, Richard Osler and Deborah Woodley (all from the North Shore) and their travels to Uganda, Rwanda and the Congo, Bellevue Gallery hosted an exhibition featuring their photographs. 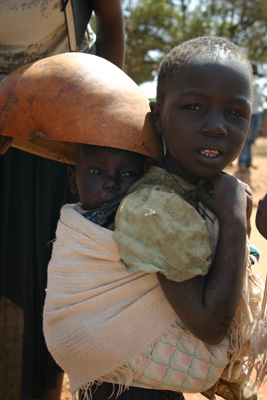 The team went as witness’ to the poverty, displacement and violence found in these areas of Africa. Admist this upheaval in the lives of the African people, they discovered grace, dignity and a spirit of hope. The photo journey, “Scarcity and Abundance” tells the story of people struggling against all odds to survive the hostility in which they live, and of the people who give their lives to working amongst them. 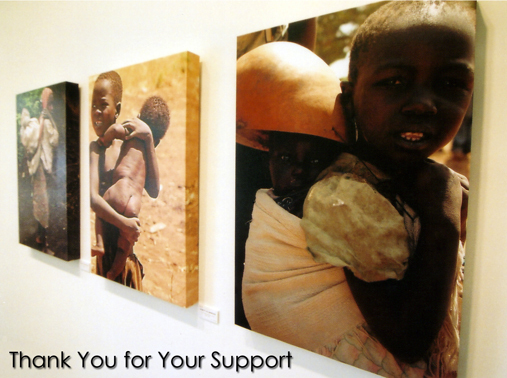 Bellevue Gallery is grateful to everyone who so generously supported this exhibition through donation, the purchase of photographs, sponsoring children, or giving of their time and expertise to bring the show together. Special thanks to the team for their labors of love, their photographs and their inspiration. Special thanks to Tim Hardy for his video presentation and to Richard Osler for his poetry, and to True Colours for their donation of shop time to prepare the canvases.